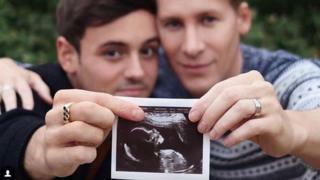 Daley, 23, revealed he had a boyfriend in a YouTube video in 2013, and the pair announced their engagement two years later. He won bronze medals at the Olympic Games in London and Rio de Janeiro. He claimed his first individual World Championship gold for eight years with a victory in the 10m platform final in Budapest last year. Black, 43, won the best original screenplay Oscar for the 2008 film Milk, which was based on the life of gay rights activist and politician, Harvey Milk. The couple had a belated honeymoon in August last year, sharing pictures from Barcelona.